The closure of Cupar Sheriff Court has been defended amid claims that promises of savings and improved facilities have not materialised. 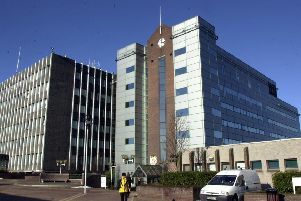 The court shut its doors in May 2014 in a highly controversial move, with all its business being transferred to Dundee. The premises, situated within Cupar’s County Buildings, are still owned by the Scottish Courts and Tribunals Service – formerly known just as the Scottish Courts Service – but their ownership is in the process of being transferred to Fife Council, with the exception of an area retained for use as vulnerable witness accommodation. However this week local Liberal Democrats, including leader and North East Fife MSP Willie Rennie, alleged that the proposed savings from the court’s closure had not been realised and that SCTS were still paying business rates on the facility. They say they got the information from Fife Council’s property services department. The Lib Dems’ claims were roundly refuted by a spokesman for SCTS, who told the Fife Herald that the court’s closure had produced more than £52,000 in savings so far. He said that a report published last July showed that savings of £28,500 had been made in the 2015-2016 financial year, with cumulative savings of £52,250 since May 2014 and an annual saving on business rates of £10,000. “At the time of the closure a pledge was given that a facility for the provision of evidence by vulnerable witnesses would be provided in Cupar,” said the spokesman. Meanwhile a prominent Fife solicitor has said that the transfer of business to Dundee has not lived up to promises of better facilities for court users from north east Fife. Douglas Williams of the Cupar-based firm Williams Gray Williams described waiting accommodation as being like ‘Paddy’s market’ and said that duty solicitors had no privacy when taking instructions from their clients. An opponent of the court’s closure from the outset, Mr Williams said that people from north east Fife such as agents, accused, witnesses, police, social workers and potential jurors had been disadvantaged by the move because of the extra time and travel involved.